I never dreamed a little dog named Agatha would change my life in so many ways. It's a snowy Saturday evening in Ohio and I'm thinking about how our puppies find their way to their forever homes. We had a visit this afternoon, a sweet couple from Columbus had brought their little girl Berkley to pick a puppy. She was over the moon with excitement, her mom said that Berkley had been pleading for a puppy for years and they'd promised she could have one for her 8th birthday. I love visits like this one. Berkley was starry-eyed and quietly exuberant about finally getting to have a puppy of her own. Does your canine companion suffer from lackluster locks? Is her coat dry and flyaway or is does she keep you busy with the Oreck trying to vacuum up all that fur that floats off her body? 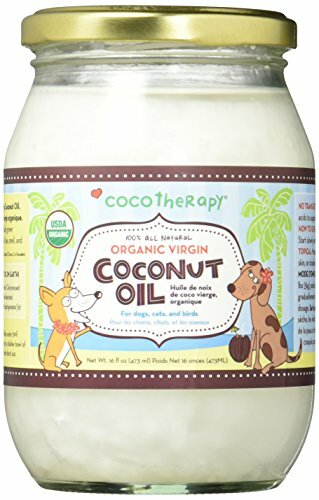 Try adding coconut oil to her diet for a rich source of coat building medium chain fatty acids. CoCo Therapy has one of my favorites with a high percentage of lauric acid but most of us have a jar hiding in the cupboard somewhere, put it out where you can see it and start using it daily. Pets AND people benefit from this nourishing little product.and as with all dietary changes, introduce slowly (about a 1/4 tsp per day for a week, increase slowly to full dose over two week period). For every 10 pounds of dog, you can give 1 teaspoon of this health boosting oil. Remember, as with all dietary changes, introduce slowly (about a 1/4 tsp per day for a week, increase slowly to full dose over two week period). For every 10 pounds of dog, you can give 1 teaspoon of this health boosting oil. Coconut Oil packs an amazing punch, not only does it have antibacterial and antiviral properties, it contains anti-fungal agents and helps eliminate eczema, helps reduce shedding and for is beneficial for many skin and coat problems. Itching, excess shedding, contact dermatitis and more can be reduced or eliminated with this one super simple addition to your pet’s diet. For a healthier skin and coat we also offer some great dog shampoos, conditioners, and dog probiotics on our online store. Dog hair got you down? As a former groomer, that was one the the most frustrating problems about life with dogs and it nearly drove our poor clients up the wall. How to deal with dog hair and excess shedding? From Cavaliers to Corgis, breeds that are not hypoallergenic have their poor owners working overtime with the Oreck, trying to prevent those clumps of dog hair from colonizing under the couch. Is there any hope for living with a shedding dog short of having him shaved and looking like a plucked chicken you ask? There are many reasons dogs shed excessively. The wrong dog food, food allergies, a lowered immune system, even stress can cause your dog to shed. Summer arrives and as the temperatures rise, heavy coated breeds like Malamutes and Shetland Sheepdogs will undergo their annual spring "molt" an event that can drive pet owners distracted trying to cope with an avalanche of fur. Feeding dry kibble??? Increase the Omega 3's with coconut oil! Many dogs have dry skin and coat (it's no wonder, many of them exist on just dry kibble which can be very dehydrating and not just hard on coat but kidneys too! Adding a teaspoon of coconut oil to that kibble can over time make a huge difference in your dog's coat. It's also reported to help with dental health and even reduce plaque, another good reason to use this tasty oil dogs relish. Agatha loves the one by CoCo Therapy but you can use your own favorite brand if you have one on hand (good for people & pets!). 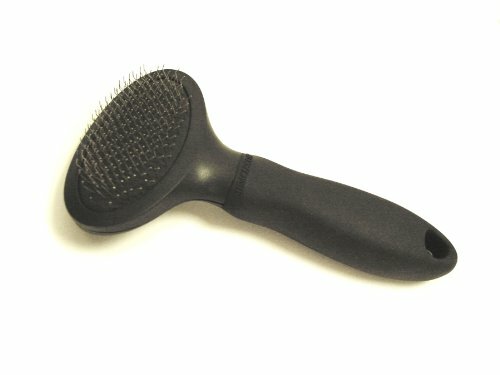 If you have a brush like this one, unless you own a Beagle please toss it out and get a proper slicker. Brushes that lack closely spaced pins won't help you remove that undercoat that's just waiting to waft off onto the carpet. 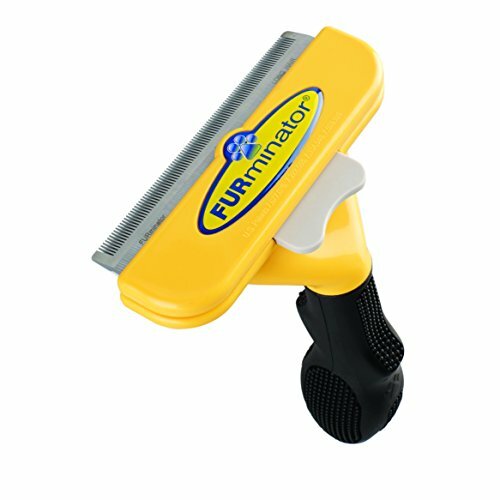 This might be OK for dogs that don't have a problem shedding, but are of little use for a truly effective grooming session. Brush your dog thoroughly at least once a week. There's no way around it, you’ve got to commit to brushing your dog regularly, and by that, I mean all the way to the skin, at least once a week. This is where most dog owners meet shipwreck so let’s discuss the problems with brushing your dog and how to overcome them. 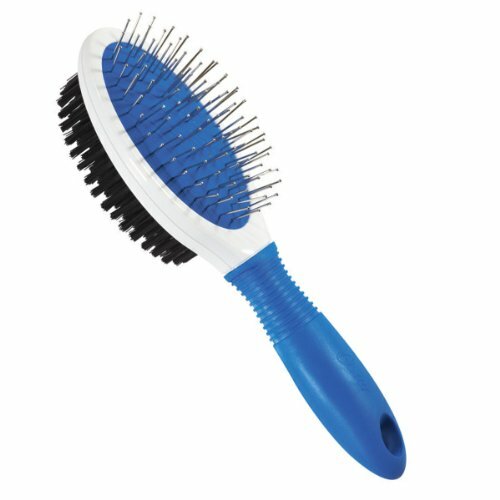 The right brush will make grooming your pet so much easier. Trust a professional on this, if you use the wrong brush, your grooming efforts are doomed to failure and you might as well go ahead and call and make that appointment to have your dog shaved. A slicker brush used properly (try it on your forearm to acquaint yourself with the proper pressure and angle to use) is the groomers go to tool for removing loose hair. Practice on yourself FIRST, it will help you be sensitive and gentle, but still firm when working through the coat. A slicker has short pins that will go through each layer of coat slowly, removing tangles and the close teeth will grab loose fur and help you remove it before it drifts off your dog and onto your hardwood floors. Keep the brush free of hair, you'll need the full length of those little pins to work down through the fur. Go easy on tender skin. Around the face, the tummy, under the tail, go easy to keep your dog cooperative. Don't try to brush too much at one time. If you find a mat, start at the edges and gently tease the coat free a 1/4" at a time. 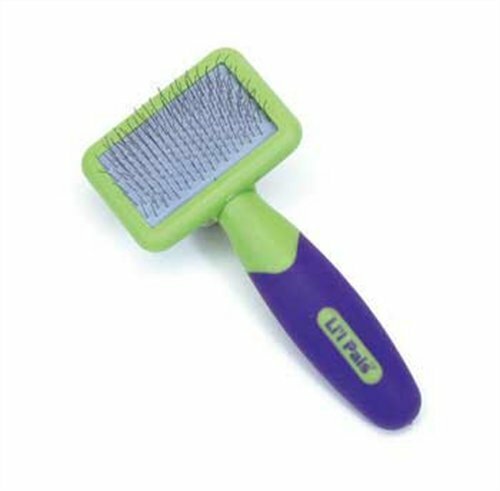 The size of your brush is important, for small breeds use a small or extra small brush. 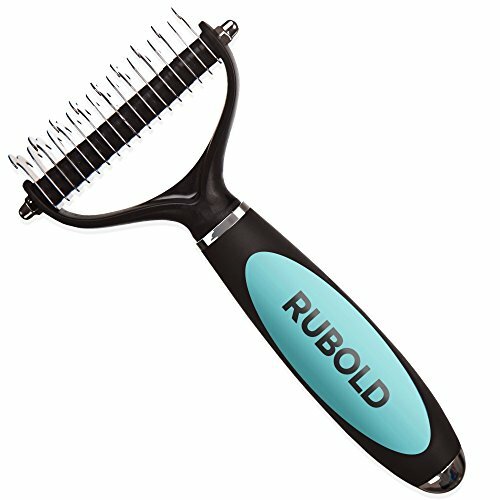 Large breeds with lots of coat will need larger size grooming tools. I use the Miracle Coat Small for Agatha and it's perfect for her. Toy breeds would do better with the Lil Pals Extra Small, if you've got a St Bernard, get the Miracle Coat Large. For breeds with serious undercoat like Huskies or Golden Retrievers, try a rake or a deshedding "tool"
These will require a bit more caution but many people absolutely love these deshedding rakes and tools. I say tread carefully, these can damage coat and the FURminator, while wildly popular, uses blades to cut through excess coat like a hot knife through butter. Purists like myself prefer not to be this heavy handed in removing coat, but for desperate owners of Aussies or other shedding machines, sometime you have to get out the big tools to maintain any semblance of victory over the huge coats these dogs carry. There are online videos and tutorials on how to use these products effectively, spend the time educating yourself before you dive into your big coated dog with these. They'll remove loads of coat so wear something you don't mind getting fur covered and by all means take this project outside if weather permits! Find a nice shady spot and prepare to be amazed at the amount of coat you get off that shaggy dog! Remember to keep grooming time fun for both you and your dog. Lots of treats and plenty of firmness will help the process along. Go slowly, take your time and break grooming time into short sessions. Get a helper if you're a novice. I'm totally in love with our grooming products of course, but if I could convince owners of shedding dogs to do just one thing to improve their plight? The best grooming advice you'll ever receive? Use coat conditioner every time you bathe your dog. I promise it will help moisturize, reduce static and brushing your dog will be soooo much easier you just won't believe it. PLEASE don't use dish detergent, on bended knee I beg you not to do that to your dog. Pinterest DIY's aside, dish detergent is the quickest way to ruin your good dog's coat, make it mat, make it hard to brush, dry out her skin and coat, the list is long. Luxury Lather & Healthy Coat were years in the making and this groomer knows her stuff, give them a try, your dog will thank you! I have owned so many really great dogs in my time, they have come into my life in a dozen different ways. Jessica “the dog of a lifetime” the gentlest of Dobie’s, sweet Jessie who walked the streets of Atlanta off lead, proud and beautiful at my side. She learned with dazzling ease, passerby’s on that Southern city’s streets opening a path as we came, the stately slim creature at my side completely without malice though she looked exceeding fierce. Bumble Bee, a rather chubby and endearingly round Pembroke Welsh Corgi, the most entertaining yet exasperating of canine companions, unlike Jessie who thrilled to obey even my silent commands, Bumble had quite a mind of her own, she,d thoughtfully weigh the benefits of obeying or disobeying each command, with a maddening disregard for any request she deemed inconvenient or requiring too much effort. I could not neglect to mention Joey, the smallest of dachshunds, with his satiny brindled coat and heart shining from his eyes. I was suddenly smitten with a tiny Tri-Color girl puppy, already distractingly pretty, she waved snowy paws at me imploring. With a nay-saying husband scowling as he headed toward the car, I scooped up the little morsel with her pink flannel tongue already kissing me adoringly. That’s been the goal of her life, to worship me, with the utter abandon only a spaniel can show. A creature so totally without malice that I’ve been humbled at the lessons she has taught me about faithfulness and about gentleness and love, and perhaps most of all about forgiveness. She has made me a better person, a better dog owner, even a better trainer and as I watch the grey begin to sprinkle its frost over her lovely face, I realize that she too will someday soon, (oh Lord not too terribly soon I pray) make my heart ache with the sad progression that all my much loved four-footed ones have led me through.